Becoming a stay at home mom can be very enjoyable. It can also be very overwhelming. Stay at home moms have more free time than most which can lead to wondering minds. " If only I had an beautiful home like hers," " Her children are always dressed so well." I wrote a post entitled Comparison where I spoke about comparison being the thief of joy. All families are different and comparing your life to someone else's can make you feel awful. 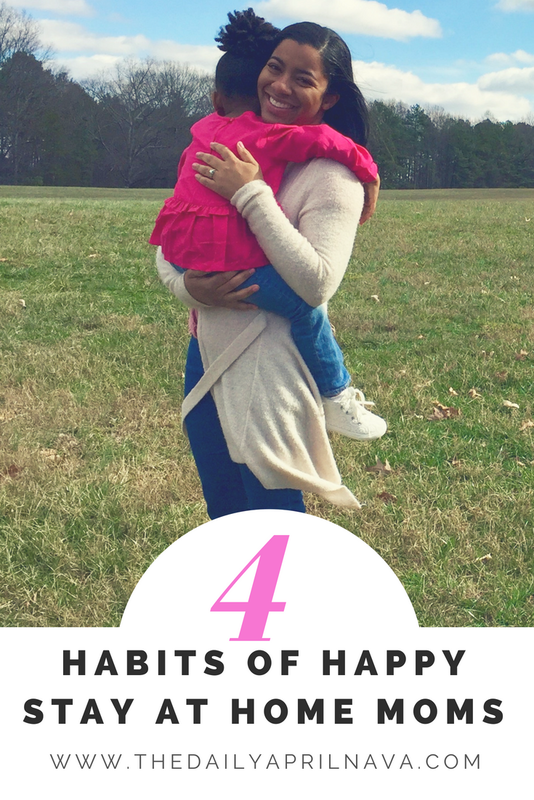 Here are a few steps that I am taking to remain a happy stay at home mom. 1. Be Grateful - The grass is always greener on the other side, or so we think. Sometimes, it can be hard to find things to be grateful for after having a rough day/week with our children. It helps to say out loud or write down things that we are grateful for to remain appreciative and to bring more positivity to our lives. I like to write a daily thankful thought in my planner, it can be as complex as "I am grateful for my family" or as simple as " I am grateful for my high speed wifi" lol. 2. Social media break - This ties into being grateful. Social media has a way of making us feel unhappy with our current situations based on what others are showing as their best situations. Taking a break helps stop the comparison to others. Try "unplugging" on the weekends and see how it makes you feel. 3. Exercise - Exercise releases happy hormones, and makes us look great! If you aren't able to workout at a gym, there are awesome workouts on YouTube that you can do at home. Wake up earlier than the kids if you have to, just try to squeeze in a 30 minute workout daily to feel your best! get annoyed easily and exercise helps with that. Also talking to and hanging out with friends, alone time, and binge watching Netflix are a few of my versions of self care. Mom life is hard, but I want to encourage specifically stay at home moms to make the most of the life that they are living. I don't have all the answers, I am learning along the way, and I am hoping to inspire others. What are some of your happy mom hacks? Leave me a comment below! Until next time. I wish I had this list when I first became a SAHM 16 years ago! Great ideas! These are so important. I preach about all of these everyday to my husband and friends. We too can get a burn out! This list would have come in handy 5 years ago when I started being a SAHM. I'm tweeting this and hope it helps new SAHM's. I guess I do my self care by sleeping more. You know how deprived sleep we are as a mom. I enjoy the fact that I can steal some cat nap when my daughter is in school instead of rushing for house chores. These are all key to staying sane as a SAHM. I for sure need to excerise more, it's so great for reducing stress. In self care, I would include finding those times when you can get away from the kids. It's amazing what a simple lunch with a girlfriend can do for the spirits. Of course, we spend that time talking mostly about kids but still, it's a nice break, LOL. Love these because they are so on point! For me having quiet time with God every morning has been such a game changer for me. These are such good simple tips. Sometimes we search for some new and different solution, when we really need to just take care of the basics. I need to work in the exercise and balance time away from social media. Tough when you work on that medium...and you want to document your life. I definitely need to remember to do more of #1, and get the kids doing it too. It is so easy to neglect yourself and burn out as a SAHM. Another thing that helps me a lot is regular date nights with my husband. A good babysitter is worth her weight in gold to me! Yes, your tips are spot on! I caught myself doing this a few times I quickly snapped out of it knowing we are all different in our own ways. Thanks for sharing! I definitely need to work on the exercise and self care parts! I absolutely agree with all of your points! I need to be better about exercising and I know it makes a big difference in how my day goes. I am a work-from-home mom and I admit I could use some work on all of these points! Self care most especially. I usually get so caught up with work and taking care of my little one that I completely neglect myself. My goal is to less like an extra on The Walking Dead! Being grateful/keeping a positive attitude and mindset has really helped me as a WAHM. It's so easy to fall into the trap of complaining and getting frustrated, but one day I just decided that I didn't want my kids to remember me as an angry/mad mom. I wanted both myself and my children to enjoy this motherhood experience. I'm not a stay at home mom but I will be going on mat leave soon which means a lot of home time. I think it's important when you are home a lot to stop focusing on all the housework and chores all the time and to have a balanced life. To make time for enjoyable things. This is a wonderful approach to motherhood April and it applies to every mother even those like myself who are single parents as well as business women. The best hack I think I would love every mother to have has to be learning how to create MSI's and become independently wealthy because I think more than half of the issues women struggle with involve that feeling of lack or not being free enough to have and be and do what they want. Moreover, it's about time we realise as mothers that we play a huge role in how our children relate to money and financial freedom. The more we feel completely in alignment and prosperous when it comes to that hot topic, the easier it will be to not only contribute more in the family but also impart the same knowledge to our children and for me that's a priority. Keep up the good work and may you prosper! I am looking forward to stay at home mom life but always wonder about my sanity. These are great tips! Self care is so important for stay at home moms since they are taking care of someone else all day! Great tips! Such great ideas, especially the social media break. It's so hard to put down that darn phone sometimes! lol. But the kids definitely notice. Thank you! Great reminders! It is especially hard to get off of social media when you are a blogger ;) I'm still trying to find that balance and separate the social media time so that I am more present with my family. Unplugging from social media is definitely key. Yes, yes, yes. Especially as a SAHM mom who blogs. "Look at her feed, it's so pretty." "I wish I could get more sponsored posts" the list of things I compare myself to is miles long. Which is why a social media break is a must. Love this! #2 is the hardest for me and I fail at it miserably most days. I am trying so hard to do better! Thank you for this! Thanks for these great reminders! I've loved using a daily gratitude practice to help me stay happy. Have you heard of the The Five Minute Journal? I've loved it as a quick way to start and end my day with a positive outlook. I struggle so much with unplugging! Being a blogger, I feel the need to constantly be checking stats or working on social media content. I gotta start taking weekends off! Number two is THE BEST! So important! Great, simple list. I gotta purge out some of that social media influence on my life, for sure. It can be really tough to stay at home and have a good routine. These are great tips, especially the social media break! Being a stay at home mom is hard sometimes hard. The one thing that helps me the most is having a schedule that works well. I really need to incorporate a social media break! Maybe I should pick times to keep my phone plugged in and then I will be more present! Love all of these so much! Self-care and exercise are a must for me! And I cannot agree more about taking a social media break. These platforms are super helpful for promotion and keeping in touch, but boy, the dark side of them is explosive. Being a blogger, I am on FB a lot for promotions but I am being intentional about sticking to that purpose alone and not get distracted when I am online. Once I am done promoting, I run the hell out. I need to work on all of these things! Social media is THE WORST, and I think especially so for SAHM's. When I switched from a SAH to a WAH mom, my joy increased dramatically, and I credit it to not "getting the chance" to check Facebook and Instagram 8,000 times a day. Everything stayed the same, including having a very busy toddler still running around...but I'm not picking up my phone in every down minute. Productivity went up, and I'm not comparing anymore. Great list...really, us mamas need to give credit where credit is due, because we're incredible, but wee're too busy looking at a screen of someone else's filtered life to remember it. Thanks April!